1. Build moyo/take big point. 2. Approach move that invites Black to take corner. 3. Avoid being shut in. 4. Press Black into low position and build influence toward center. 5. Reduce value of Black's thickness while expanding moyo. SnotNose: This position and problem came from an actual teaching game I played against a (approximate) 10-kyu. He wanted practice as White in an even game and with non-star point openings. So, I took Black and none of the first moves were on star points. We had already talked about some of the game up to here and was played as a tenuki joseki experiment (my 10-kyu friend was quite neverous about it but gave it a shot anyway). At this stage, the 10-kyu was puzzled about where to move and he proposed as possibilities some of the suggestions made in the question (I added a few more to round-out the problem, though maybe in doing so I just made it too hard). a was a proposal to keep from being shut-in on the top right. I felt that this was small/endgame and would only help Black build a more imposing wall facing the center. Moves on the second line should (often) wait until later. b wasn't proposed by the 10-kyu but a move one point higher was. I thought that a move one point above b would invite a pincer, possibly lead to a running battle, and make Black's thickness look good (though I had to be a bit vague about this because it is not so obvious to me how the fighting would go). I suggested b (or one point the the right of b) as a move that is often played when one doesn't want to get pincered. However, a pincer is still possible. By playing b, White hopes that Black closes the corner and then White can settle on the left. I actually thought this was among the best moves in this situation but I'm not sure if it is the best among the options presented here or overall. A White position on the left would be a good launching point from which to blunt/reduce Black's thickness later. This is longer-range planning so I had to be vague on details. Also, a move by Black in the direction of b seems to give Black really good options (build a center moyo that might include the top and left, build territory on the left, build a structure that coordinates Black's two stones on the left). This is more of an intuitive reaction but visualizing a Black stone at b just looks really big for Black (to me). c seems a clear big move and builds a White moyo. Playing this move will result in a moyo race and I think Black can build on a larger scale. 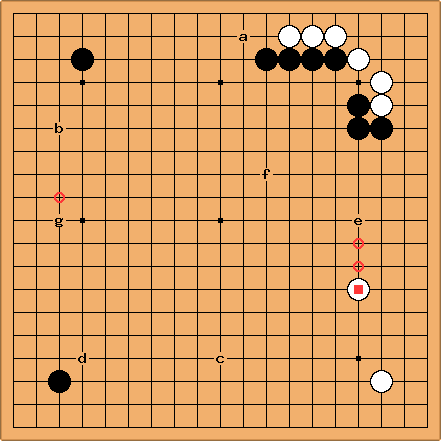 But, White is already ahead in real territory and has komi. So, I think this move is playable. d will give Black more territory and White some center-facing influence. Since White is ahead on territory, this is a fine plan. My only stated reservation was that it might be better to approach this corner from the bottom (or leave that possibility at least), to develop a White moyo there. So, it is not the move I'd choose but I can't be very critical of it. e, to reduce the utility of Black's thickness was the first move that occurred to the 10-kyu. (He was initially most torn between e and a.) I thought that it showed an obsession with this thickness at too early a stage. That is, White can blunt it in at least three ways (e, f, or a play on top) later so there is no urgency to do it now. Moreover, if all Black does is use his thickness to try to make territory by expanding in the direction of e, White should be happy. This would be a slow way for Black to play. White should not be in a hurry to prevent Black from making a slow move. Lastly, was already played as an "influence blocker" so to add yet another move to that effect seems to be putting too much emphasis on one element of the game. f--an example I added later of how White might reduce Black's influence. Not appropriate now for reasons mentioned above. There are many big moves around the sides and corners still. g. I added this splitting move idea later. It didn't come up during the game. I don't like this move here. My main criticism of it is that it yields control to Black. It seems to be a move without direction. Alex Weldon: My only comment is that, because we're trying to keep these pretty easy, hence "beginner" in the title, the moves given should be either quite clearly (to us) a good way to accomplish the task or quite clearly (to us) to fail in the stated purpose, or be way too small. Moves like e and f seem wrong to me partly because they're too small, but also partly because, with the marked White stone in place, you don't need one until Black gets a stone in the vicinity of the other... they're almost miai that way. Even that's not an adequate description of what I feel about those moves, so I'd hate to have to try to explain it to a beginner. We needn't limit ourselves to Beginner Move Function Problems, though. My original intent was to later create some more advanced ones, like Joseki Move Function Problems? (choose a branching point in a joseki, and offer the possible moves, asking the student to figure out what is likely to be the possible result of each choice - give up the corner for influence on the left, take the corner, or press opponent into a low position... something like that). Velobici: can 1 map to this board position? there isnt a moyo on the board to be expanded. the two white stones in the lower right dont constitute a moyo. certainly the white stones in the upper right are not a moyo. 1 should be reworded. assuming that 1 is the explaination for c, how about "work towards forming a moyo" if we must speak of a moyo here. "take big point" seems even better. This would be the best extension-in-place when later attacking the Black komoku, allowing all possibilities of placement. It takes away all prospects from a komoku extension on the left side (better than g). Also still it would be only loosly attacked by it, allowing White to invade between Black's left and right group, therewith taking away the prospects on the top side. It keeps more distance to the sansan than g. That's good, because the sansan makes attacks from below stronger; having just the one stone more space between sansan and an one-space attacking stone would be a welcome benefit for future invasion. For the same reason being attacked from above is less severe than for g, because from the circled point there is enough room to make a working four-space extension (so leaving all options open). A four-space extension from g would make invasion too easy for Black. Summing up, as splitting move the circle point leaves no good follow-up move for Black, while giving excellent support for White attacks (Any stone around g is good for attack against sansan.). Summing up for the whole board, the circled point is the last big play, disallowing to create and take a new one. g would allow Black to follow-up very profitably. The same is true for b. See next item regarding c not being that big. I think c is not a big point here, it does not create a useful moyo: When Black invades between c and White's sansan, there is not much to keep on the right (because White's corner being a sansan) and nothing to win on the left (because of Black's sansan). The sansans not only make c small, playing near sansan early is rarely good: sansan is a small bull-terrier ready to bite the opposite color, but to small to be profitable for its own color. That means, would better have been played on one of the circled points above it.